It won't be long before I'll have to stop using "Summer" as a heading for these reviews! The hot weather certainly hasn't gone away though. Weekends lately have been perfect for snuggling up in front of a fan (sometimes turned up so high I also need a blanket, which defies logic) with a great book and a glass of something cold. As you've no doubt already seen, this past weekend was the Perth Writers Festival, which always puts me in a tizzy of reading. This year was no exception, and in the last three days I have finished reading three (!) books. 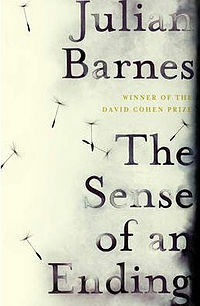 The first was Julian Barnes' The Sense of an Ending which won the 2009 Man Booker prize, but was more recently drawn to my attention by my good friend Jaime's Instagram account. Bless her. She made it look so good, the next time I saw it, I bought it. And can I just take a moment to talk about this edition? It's absolutely exquisite! But enough about the cover, let's talk about the book. The Sense of an Ending begins with four English boys, Tony, Alex, Colin and Adrian who all attend a highbrow English boarding school. Adrian is sort of the outsider as he is quiet, contemplative and seems to be a lot smarter than the others, although his alternative perspective makes the others think that he's a little weird, and that perhaps he needs them more than they need him. From their constant ploying for his attention however, I think the opposite is really the case. When one of their classmates commits suicide, rumours run rife about why. Did this other student get his girlfriend pregnant? Did he really leave a note that just said "Sorry, Mum?" Adrian seems to be the only one with any real insight, and the student's suicide, like history, becomes a matter of the 'Truth' being written by those with the power to do so, or the indignation to complain. Years later, Tony and Adrian have a parting of ways over a girl- while Tony remembers Veronica as being possibly the worst first girlfriend ever, the book posits that memory is fleeting and we are forced to keep this in mind as the book goes on. Tony remembers giving the two his half-hearted blessing, and is shocked when, Adrian commits suicide himself. It is only when Veronica's mother dies and leaves Tony a most confusing package that Tony is forced to reassess what really happened, and learns that truth is as slippery as a wet bar of soap. The book is beautifully written, although at times I think there is a tendency to gloss over important images in the name of expediency. It is a short book, but it takes a fair while to read, and I think that to fully understand it, I would have to read it many many times. All in all, I would say that this is a sad and thematically important book, but one which will probably alienate most readers, as it is not the most fast paced or entertaining. It is, like most Booker prize winners, part of that exclusive club called Big L Literature, and I am not sure I truly got it until the end. Reading the final few pages, a coldness settled in my sternum and would not go away. Because of the almost overly dramatic solution to the book's puzzle, I would put this effect down to excellent writing almost exclusively. The story is not so great. But, the way it is told is brilliant. It is full of surprises and a little suspense, but at the end, the story does not appear worth of remembering. It finely narrates some events that started some half a century ago and enter in the present. The journey of a man from the childhood in the fifties/sixties to getting aged in the present world has been well-depicted (Although the story has a jump in time for about 30/40 years). There is a reality unknown to the narrator. The unwrapping of that reality is done fantastically. Besides, the issues raised in different contexts are extra-ordinary, unconventional. Everyday-things appear in new colors. So, it is an experience reading this novel. I will recommend this work to all those in search of a different taste in reading, but not to those who are in search of a new story. At the end, I felt that I did not read the whole novel to reach at this event which was to me quite boring and unworthy of my labor reading it. Although, I was entertained by how the whole story was told.